Received February 6, 2017; Accepted February 23, 2017.; Published online February 27, 2017. Caenorhabditis elegans is an important model organism with many useful features, including rapid development and aging, easy cultivation, and genetic tractability. Survival assays using C. elegans are powerful methods for studying physiological processes. In this review, we describe diverse types of C. elegans survival assays and discuss the aims, uses, and advantages of specific assays. C. elegans survival assays have played key roles in identifying novel genetic factors that regulate many aspects of animal physiology, such as aging and lifespan, stress response, and immunity against pathogens. Because many genetic factors discovered using C. elegans are evolutionarily conserved, survival assays can provide insights into mechanisms underlying physiological processes in mammals, including humans. The roundworm Caenorhabditis elegans is an outstanding model organism for studying molecular genetics, developmental biology, neuroscience, and cell biology. Many in vivo experiments using C. elegans can be done in a relatively short time. C. elegans has up to 300 progeny and 3-day generation (Corsi et al., 2015). Its maintenance cost is low, as C. elegans is very small (approximately 1 mm long), feeds on inexpensive bacteria, such as Escherichia coli, and can be stored long-term at −80°C or in liquid nitrogen. C. elegans is also amenable to sophisticated, yet convenient, genetic techniques, such as feeding RNAi, transgenesis via microinjection, mutagenesis screening, and CRISPR/Cas9 genome editing. Its transparent body allows researchers to easily detect expression of various fluorescent proteins, including green fluorescence protein, in live animals. C. elegans survival assays have been key tools for studying physiological processes, including aging, stress resistance, and immunity. One noticeable advantage of C. elegans for such assays is that synchronized isogenic populations are simple to prepare because the worm usually exists as a self-fertilizing hermaphrodite that produces hundreds of isogenic progeny. Males are rarely used for survival assays (Gems and Riddle, 1996) but are useful for genetic crosses. Most C. elegans survival assays take a relatively short time; for example, C. elegans stress resistance and lifespan assays usually take several days and weeks, respectively. Importantly, many genetic discoveries made by employing C. elegans survival assays are evolutionarily conserved, such as the role of insulin/IGF-1 signaling (IIS) in aging regulation in Drosophila and mammals (Kenyon, 2010; Lee et al., 2015). For most C. elegans survival assays, both solid and liquid media systems with bacterial foods are employed. Standard temperatures for survival assays range from 15°C to 25°C, though 20°C is the most widely used temperature. Exact environmental conditions for survival assays should be determined depending on the specific features of the survival assays (Amrit et al., 2014; Keith et al., 2014). Here, we briefly discuss the methods, requirements, advantages, and disadvantages of different survival assays using C. elegans, such as lifespan assays crucial for aging research, various abiotic stress resistance assays, and pathogen resistance assays important for studying immunity. C. elegans is a popular model for studying aging because of short lifespan and genetic tractability. Lifespan measurement is a direct method that determines the consequence of aging and death. Researchers count live and dead worms in synchronized populations at regular intervals (e.g., 1 or 2 days) and discard dead worms to prevent confusion while performing subsequent counting. Lifespan curves are then generated to illustrate the percentages of live worms in populations over time, and the data are statistically analyzed. Here, we discuss representative C. elegans lifespan assays using solid and liquid culture systems (Fig. 1). Agar-based solid culture systems are the most common C. elegans lifespan assay approach. Nematode growth media (NGM) agar plates seeded with bacterial food, usually E. coli, comprise standard solid culture systems (Stiernagle, 2006). These systems make observing the live or dead status of worms relatively straightforward but have several limitations. Worms frequently crawl off plates or burrow into the agar, which results in unintentional loss of worms for subsequent analysis. In addition, NGM plates can become desiccated during the lifespan assays, though this problem can be prevented by regularly moving worms to fresh plates. Detailed methods for lifespan assays using solid medium systems are described in another review article (Amrit et al., 2014), but here, we will discuss the methods very briefly. First, synchronization of the specific developmental stages of worms is required. Gravid adult worms are allowed to lay eggs overnight on bacteria-seeded NGM plates and are subsequently removed from the plates. Animals hatched from the eggs that become young adults are then transferred to fresh bacteria-seeded NGM plates for lifespan assays. The synchronized adult worms will lay eggs and need to be distinguished from their progeny. This synchronization method is the standard protocol for most solid culture-based survival assays described in this review. After preparation of sufficient young-adult-stage animals, the number of dead and live worms should be regularly counted, and dead worms should be removed. A general method for determining death is counting worms that do not respond to a gentle touch with a sterilized platinum wire. Alternatively, the live status of worms can be determined by observing avoidance from a heated platinum wire located close to their heads (Amrit et al., 2014). Another method is executed by flooding many replica plates with water at each time point and counting animals responsive to a gentle touch to the surface of water with a platinum wire (Samuelson et al., 2007). In all these methods, worms are censored if they are missing, have crawled off, have burrowed, or display internal hatching or vulval rupture. However, these censored worms are still included in subsequent statistical analysis. Media for liquid culture-based C. elegans lifespan assays usually consist of S-basal buffer and concentrated E. coli (Stiernagle, 2006). Due to the homogeneous nature of liquid media, these assays are suitable for screening the effects of diet components and chemical treatments on the worms. These assays are also amenable for testing the effects of dietary restriction on lifespan by diluting dietary bacteria in liquid. However, several disadvantages exist for liquid culture-based lifespan assays. Handling worms with a platinum wire is difficult in liquid conditions, and culturing worms in liquid media needs additional devices such as a platform shaker for aeration. For synchronization of worms, L1 larvae that have just hatched are transferred to liquid culture medium. Before synchronization, eggs are collected from gravid adults by using a method called bleaching, which can also be used for large-scale, solid culture lifespan assays (Amrit et al., 2014). During bleaching, gravid adults are treated with sodium hypochlorite and washed with M9 buffer, a widely used phosphate-based buffer for C. elegans research. Because eggs are more resistant to bleaching than worms, the eggs survive and are then allowed to hatch in aerated liquid medium overnight on a rotating platform shaker. The hatched, developmentally arrested L1 larvae are then collected by centrifugation, resuspended with M9 buffer, and transferred into new liquid medium-containing plates for synchronization prior to lifespan measurement. Methods for identifying dead worms differ between liquid and solid culture systems. In liquid-based assays, worms that do not display spontaneous movements or respond to shaking are counted as dead. Fluorescent dyes, such as SYTOX, that stain dead worms by penetrating their cell membranes and emit fluorescent signals can be used to facilitate counting (Gill et al., 2003). An automated detector, such as a plate-reading fluorometer or COPAS BIOSORT, is used to quantify fluorescence levels over time (Gill et al., 2003; Pulak, 2006). For both solid- and liquid-based lifespan assays, separating adult hermaphroditic worms from their progeny is a significant challenge, as progeny that have reached adulthood are difficult to distinguish from their mothers. The most straightforward way to resolve this issue is transferring synchronized adult worms for lifespan assays onto new plates every 1 or 2 days until the worms do not produce progeny. However, constant transfer of worms can cause them physical damage and is relatively labor intensive. Therefore, this method is more suitable for small-scale lifespan experiments. For large-scale lifespan assays, several alternative and complementary methods have been used. First, treatment with 5-fluoro-2′-deoxyuridine (FUdR), which inhibits DNA synthesis, is a popular method that prevents progeny from hatching. However, caution is needed because FUdR treatment itself affects the lifespan of several mutant worms (Aitlhadj and Stürzenbaum, 2010; Rooney et al., 2014; Van Raamsdonk and Hekimi, 2011). Second, temperature-sensitive sterile mutant strains, including fer-15(b26); fem-1(hc17), glp-4(bn2), and gon-2(q388), are used for lifespan assays (Beanan and Strome, 1992; Garigan et al., 2002; Sun and Lambie, 1997). In general, these mutant worms are first grown at permissive temperatures (15°C or 20°C) for propagation, and their progeny that will be used for lifespan assays are cultured at restrictive temperatures (25°C) to induce sterility. However, several limitations should be noted. First, temperature-sensitive sterile mutations used for preventing reproduction may have interaction with target genetic manipulations to be examined during the lifespan experiments. In addition, generation of double or triple mutants is required for testing the effects of specific genes on lifespan in temperature-sensitive sterile mutant backgrounds. Further, temperature conditions for lifespan assays are limited, as the induction of sterility requires culturing worms at specific temperatures for a substantial time period. Another common feature for lifespan assays is that bacteria act as food sources. Byproducts derived from bacteria may affect the lifespan of worms, and may confound results of the assays. To exclude these possibilities, worms can be fed with killed bacteria, or axenic media devoid of live food source can be used (Cabreiro et al., 2013; Lee et al., 2009; Lu and Goetsch, 1993). However, axenic media cause physiological changes in worms, including delayed development, reduced brood size, and extended lifespan (Szewczyk et al., 2006). The conventional lifespan assays described above are manual counting assays that have several limitations; for example, manual assays are labor intensive and prone to researcher-oriented bias, and worms are vulnerable to mechanical and heat stresses induced by platinum wire usage. To overcome these limitations, various automated assay tools have been developed. For solid culture systems, “WormScan” can automatically determine the death of worms using movement parameters (Mathew et al., 2012). Subsequently, the “Lifespan Machine,” a fully automated device for measuring worm lifespan, processes time-lapse photographs and analyzes worm survival data, has been developed (Stroustrup et al., 2013). For liquid culture-based systems, a microfluidic device called “WormFarm” removes progeny based on differences in worm size and automatically detects death via video recording (Xian et al., 2013). 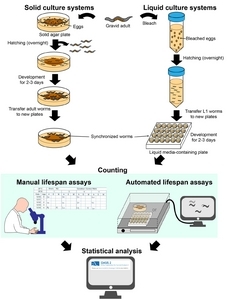 Overall, these automated lifespan assays are appropriate for large-scale and/or unbiased assays and are complementary to the conventional manual lifespan approaches discussed above. Research of stress resistance provides valuable information regarding the interaction between internal or external stresses and biological processes, such as cellular homeostasis. 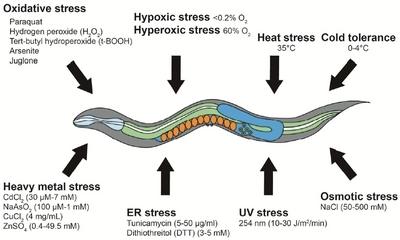 Here, we describe C. elegans survival assays that measure the worms’ resistance against various abiotic factors, including oxidative stress, hypoxia, hyperoxia, heat, cold, osmotic stress, ultraviolet (UV) radiation, endoplasmic reticulum (ER) unfolded protein stress, and heavy metal stress (Fig. 2). Survival assays under oxidative stress conditions provide information regarding biological systems crucial for responding to oxidative stresses. C. elegans oxidative stress resistance assays are performed by treating worms with various reactive oxygen species (ROS)-generating chemicals. Overall procedures of oxidative stress assays are very similar to those of lifespan assays, except for treatment with ROS-generating chemicals and time frame of the assays. Due to chemical toxicity, oxidative stress resistance assays are completed in relatively shorter times than lifespan assays. Thus, dead worms should be counted in short intervals (e.g., every 1 or 2 h) to obtain proper survival curves for statistical analysis. Understanding the nature of specific ROS-generating chemicals is important for properly designing oxidative stress assays (Keith et al., 2014; Sies, 1985). Paraquat, an organic compound used as an herbicide, produces superoxide anions and is widely used as an oxidative stress inducer. Hydrogen peroxide (H2O2) is a commonly used bleaching and decontaminating reagent. Tert-butyl hydroperoxide (t-BOOH) is a highly reactive and toxic organic peroxide that acts as a radical polymerization initiator. Arsenite blocks pyruvate dehydrogenase and destroys energy production systems via increasing intracellular ROS levels. Juglone is a highly poisonous organic compound that forms a semiquinone radical and induces cell death by generating a large amount of superoxide anion radicals. Surprisingly, recent studies have shown that low concentrations of oxidative stress-generating reagents increase lifespan in many organisms, including C. elegans (Hwang and Lee, 2011; Hwang et al., 2012; Wang and Hekimi, 2015). For example, we showed that low doses of paraquat (0.015 mM to 1 mM) extend the lifespan of C. elegans, whereas high concentrations (4 mM to 64 mM) decrease lifespan (Hwang et al., 2014; Lee et al., 2010). These results indicate an inverted U-shaped dose-response curve for paraquat and worm lifespan (Hwang et al., 2014; Lee et al., 2010; Van Raamsdonk and Hekimi, 2012; Yang and Hekimi, 2010). Thus, choosing appropriate concentrations is essential for testing the effects of ROS-inducing reagents on lifespan and oxidative stress resistance. As oxygen is essential for aerobic organisms, animals are equipped with systems to adapt to different oxygen levels. Hypoxia and hyperoxia refer to conditions in which biosystems are exposed to abnormally low and high levels of oxygen, respectively (Rodriguez et al., 2013). C. elegans exerts responses to both conditions and has been studied in hypoxic and hyperoxic stress survival assays. This has led to the characterization of key genetic factors, including hypoxia-inducible factor 1 (HIF-1), the master regulator of cellular hypoxic responses (Powell-Coffman, 2010). Hypoxia can be induced in two distinct ways, physical and chemical induction methods (Jiang et al., 2011; Scott et al., 2002). For physical induction, worms are placed in a sealed hypoxic chamber (< 0.2% O2) filled with a constant flow of an anoxic gas mixture containing CO2, H2, and N2. For chemical induction, worms are treated with fresh 0.5 M sodium azide, which causes cellular hypoxic responses via inhibiting mitochondrial respiration complex IV. Worms exposed to hypoxia for a specific time are then transferred to NGM agar plates for recovery in room air, and numbers of dead worms are scored at regular intervals (e.g., several hours). Hyperoxia can be achieved by using a sealed chamber filled with 60% O2 (Doonan et al., 2008). Dead worms are then counted at regular intervals (e.g., every 1 to 3 days). High environmental temperatures cause structural and functional impairments in macromolecules, wreaking havoc on animal physiology. In C. elegans, high temperatures cause cellular defects, such as neuronal degeneration and heat-induced necrotic cell death (Kourtis et al., 2012; Labbadia and Morimoto, 2015). C. elegans is equipped with systems that protect cells from the deleterious effects of high temperatures. Heat shock transcription factor-1 (HSF-1) and the forkhead box O (FOXO) transcription factor DAF-16, which upregulate chaperone expression, reduce the accumulation of abnormal proteins and contribute to cellular protein homeostasis in C. elegans (Labbadia and Morimoto, 2015). Overall, heat stress resistance assays provide foundations for identifying factors that regulate protein homeostasis. A typical temperature for acute heat stress resistance (thermotolerance) assays is 35°C (Lithgow et al., 1994). At this high temperature, C. elegans moves very slowly and starts dying within hours, and thermotolerance assays using wild-type animals are completed within 24 h. Thermotolerance assays require very precise temperature control systems, as uneven temperature distribution in an incubator or a small temperature change between experiments may cause large variations in survival rates. C. elegans also displays changes in physiology at low temperatures. For example, C. elegans preserves cell membrane fluidity by increasing the total proportion of unsaturated fatty acids at low temperatures (Murray et al., 2007; Savory et al., 2011). Cold tolerance assays using C. elegans can potentially help identify important mechanisms that regulate cold adaptation, including lipid homeostasis. C. elegans cold tolerance assays involve synchronized L4 larval stage or young adult worms at specific temperatures ranging from 0°C to 4°C (Murray et al., 2007; Savory et al., 2011; Sonoda et al., 2016); temperatures below 0°C should be avoided because worms are frozen to death immediately. For survival monitoring, worms exposed to a specific cold temperature for a certain time are transferred to normal culturing temperatures (20°C or 25°C) for 20 min to 1 h for recovery. Dead worms are then counted similarly as described for other survival assays. Monitoring time interval should be determined depending on temperatures, which can be hours (0°C to 2°C) to days (4°C). In natural environments, animals are exposed to various kinds of osmotic stresses. Hyperosmotic shock induces water efflux and protein aggregation, leading to body deterioration and protein homeostasis (proteostasis) (Choe and Strange, 2007; Rodriguez et al., 2013). Organisms are equipped with several protection mechanisms that help maintain cellular osmotic homeostasis. These include increased levels of osmoregulatory solutes that function as chemical chaperones, including glycerol, sorbitol, inositol, and trehalose, and the induction of osmoprotective genes. Osmotic stress resistance assays using C. elegans are usually performed on NGM containing various concentrations of NaCl (e.g., 50 mM to 500 mM) using L4 larval or young adult worms at 20°C (Lamitina et al., 2006; Rohlfing et al., 2010). The assays are executed to detect both acute (3 to 15 min) and chronic responses (hours to days) to hyperosmotic stresses. Time intervals for worm counting should be determined depending on the concentrations of NaCl and characteristics of worm strains used. Ultraviolet radiation (100 to 400 nm) is a major DNA-damaging environmental stress for most terrestrial organisms. UV stress induces DNA lesions and produces free radicals that damage other cellular macromolecules. Most organisms have defense mechanisms against UV radiation, such as nucleotide excision repair pathways, that repair damaged DNA (O’Neil and Rose, 2006). Because UV radiation can cause harmful effects in humans, researchers should be cautious during UV light stress assays. Liquid media culture systems are not suitable, as liquid absorbs UV and decreases its effective dosage. Ultraviolet light has dose-dependent effects on the health and survival of C. elegans, and in most cases, 10 to 30 J/m2/min of radiation are used (Murakami and Johnson, 1996; Wang et al., 2010); however, the specific doses of UV radiation selected depends on biological questions and the UV resistance properties of the worm strains used in the assay. Survival against UV radiation can be performed using different stages of worms to determine its stage-specific effects. Protein homeostasis (proteostasis) is essential for cellular function and survival. Unfolded protein responses (UPRs) are elicited by many environmental stresses or genetic perturbations in the cytosol, ER, and mitochondria, and are key defense mechanisms for maintaining proteostasis. Each UPR transmits signals from a specific cellular compartment to the nucleus. Evolutionarily conserved signaling factors, including IIS components, target of rapamycin, and AMP kinase, regulate proteostatic stress responses (Vilchez et al., 2014). Among these UPRs, we will focus on ER stress assays that determine survival of animals upon treatment with chemical ER stressors that induce UPRER. Accumulation of unfolded proteins in the ER acts as stress signals that are transmitted to the nucleus (Walter and Ron, 2011). Representative ER stress-inducing agents include tunicamycin and dithiothreitol (DTT). Tunicamycin is a widely used inhibitor of UDP-N-acetylglucosamine-dolichol phosphate N-acetylglucosamine-1-phosphate transferase (GPT) (Kuo and Lampen, 1974). Therefore, tunicamycin results in accumulation of unfolded glycoproteins, which leads to ER stress. Typical C. elegans ER stress assays are performed over several hours by incubating worms on E. coli-seeded NGM plates containing tunicamycin (Shen et al., 2001). Tunicamycin is water insoluble and therefore should be dissolved by using dipolar solvents, such as dimethyl sulfoxide. Dithiothreitol is a reducing agent that blocks disulfide bond formation (Cleland, 1964) and induces an immediate ER stress. For DTT-based ER stress assays, worms are treated with DTT on plates seeded with E. coli (Shen et al., 2001). Non-essential heavy metals whose specific gravity is over 5 g/cm3, including cadmium and arsenic, have harmful effects on organisms by altering the function and structure of their proteins or by generating ROS. Bioaccumulation of heavy metals causes severe diseases in humans, such as poisoning, renal dysfunction, and damage to the central nervous system (Jaishankar et al., 2014). Molecules that detoxify heavy metals include metallothionein proteins, which contain many cysteine residues and protect cells by chelating heavy metal ions (Freedman et al., 1993). As these factors are evolutionarily well conserved, heavy metal resistance assays using C. elegans can lead to important insights into the pathology of relevant human diseases. For C. elegans heavy metal stress assays, metal salts are dissolved and mixed with culture media (Keith et al., 2014). Typical concentrations and durations for specific heavy metal treatments are described as follows: CdCl2 (30 μM to 7 mM) for 8 to 24 h, NaAsO2 (100 μM to 1 mM) (Oliveira et al., 2009) and CuCl2 (4 mg/ml) for 6 to 16 h, and ZnSO4 (0.4 mM to 49.5 mM) for 6 h up to several days. Because different mutants exhibit different lethal dosages, conditions should be optimized for specific experiments (Barsyte et al., 2001; Hall et al., 2012). In addition, extensive care is needed when performing these assays, as heavy metals adversely affect human health. Survival assays for pathogen resistance provide important information regarding host defense mechanisms and antagonistic relationships between pathogens and hosts. Understanding pathogenesis is also the basis for identifying prophylaxis and treatment strategies against infection. Various pathogens, including bacteria, have been used for pathogen resistance assays using C. elegans as a model host (Darby, 2005; Ewbank, 2006; Hodgkin and Partridge, 2008) (Fig. 3). C. elegans pathogen resistance assays can be used for research into the evolution of pathogenic virulence as well (Ford et al., 2016; Kim and Ausubel, 2005). Recent identification of infectious parasitic microsporidia (Hodgkin and Partridge, 2008; Troemel, 2016) and viruses (Félix et al., 2011; Franz et al., 2012) raises the possibility of using C. elegans as a model host for research of these pathogens as well. Pathogenic bacteria are categorized into two groups, Gram-negative and -positive bacteria (Darby, 2005). 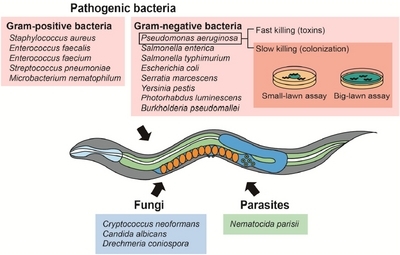 Pseudomonas aeruginosa, a ubiquitous Gram-negative bacterium that causes opportunistic infections, is the most popular model pathogen in C. elegans pathogen resistance assays. Salmonella species such as S. enterica and S. typhimurium, are other commonly used Gram-negative pathogenic bacteria. E. coli can be used for pathogen resistance assays by culturing the cells in nutrient-rich brain-heart infusion (BHI) medium. Serratia marcescens, Yersinia pestis, Photorhabdus luminescens, and Burkholderia pseudomallei are other examples of Gram-negative bacterial pathogens of interest. Gram-positive pathogenic bacteria, such as Staphylococcus aureus, Enterococcus faecalis, Enterococcus faecium, Streptococcus pneumoniae, and Microbacterium nematophilum are used for pathogen resistance assays. Because the general methods for most C. elegans survival assays using pathogenic bacteria are similar, we will focus on P. aeruginosa as the pathogen of interest. P. aeruginosa kills worms through two distinct mechanisms (Kirienko et al., 2014). First, bacterial colonization in the intestine kills C. elegans through quorum sensing and generating multiple virulence factors. Second, P. aeruginosa can rapidly kill C. elegans within 24 h through the secretion of lethal toxins. These two mechanisms have been used for establishing slow- and fast-killing assays. For slow-killing assays, PA14, the most commonly used P. aeruginosa strain, is grown on low-osmolarity agar medium, whereas PA14 is grown on high-osmolarity media for fast-killing assays. Another recently developed assay relies on a nutrient-poor liquid culture killing assay in which worms are killed within 48 h by PA14 in liquid medium (Kirienko et al., 2013). Among the assays described above, slow-killing assays are the most popular survival experiments using P. aeruginosa. Two subtypes of slow-killing assays, the “small-lawn” assay and the “big-lawn” assay, have been used. Plates for small-lawn assays, which are more popular than big-lawn assays, are prepared by dropping small volumes of bacteria on plates (e.g., 4 to 10 μl of bacterial culture per 35-mm plate). Plates for big-lawn assays are prepared by spreading large volumes of PA14 (e.g., 12 to 20 μl of bacterial culture per 35-mm plate) throughout the entire agar plate. Unlike small-lawn assays, no PA14-free space is present on big-lawn assay plates where worms can avoid PA14. Performing both small- and big-lawn PA14 resistance assays can help identify different mechanisms of pathogen resistance (i.e., pathogen avoidance behavior vs. innate cellular immunity) (Reddy et al., 2009). Several specific considerations for slow-killing PA14 survival assays should be noted. First, concentrations of PA14 affect virulence of the bacteria due to quorum sensing (Papenfort and Bassler, 2016). Therefore, proper cultivation temperatures and media composition, as well as the preparation of fresh bacterial lawns, are crucial for performing reliable assays. Second, using worms in proper developmental stages is critical; young adults and L4 larvae are routinely used for the assays (Darby, 2005; Keith et al., 2014). Third, due to prevalent internal hatching of the worms, FUdR treatment is highly recommended. Fourth, dead worms should be counted every 6 to 12 hours because they quickly lyse and become transparent due to exoenzymes produced by PA14. Opportunistic fungal pathogens, which are capable of infecting and killing C. elegans, are established for killing assays (Mylonakis et al., 2007). These include Cryptococcus neoformans, Candida albicans, and Drechmeria coniospora. Studies regarding fungal pathogenesis by using C. elegans as the host suggest extensive similarities between fungal virulence factor action in C. elegans and mammals. Here, we describe worm survival assays using C. neoformans more in detail. C. neoformans is a human opportunistic and facultative intracellular fungal pathogen (Alspaugh, 2015). Various virulence factors, such as laccase and a polysaccharide capsule, and signal transduction cascades that affect virulence have been identified. The fungi kill C. elegans by accumulating within its gastrointestinal tract. For pathogen resistance assays, C. neoformans strains are cultured in Yeast Extract-Peptone-Dextrose broth at 28°C for approximately 48 h (Mylonakis et al., 2002). The fungal culture is then spread on plates containing BHI agar or NGM and incubated overnight. The worms are then transferred onto the fungus-containing plates, and the assays are performed at 25°C. The microsporidian Nematocida parisii is an intracellular pathogen that kills C. elegans (Hodgkin and Partridge, 2008; Troemel, 2016). N. parisii exists outside of the C. elegans intestine as spores that contain nuclei and a specialized structure called a polar tube used for the injection of nuclei into host cells. The N. parisii cells then grow and disrupt cytoskeletal structures in the intestinal cells and subsequently produce spores that horizontally infect neighboring cells. Interestingly, the responses of C. elegans against N. parisii infection are distinct from those against fungal and bacterial pathogens (Ewbank, 2006; Troemel, 2016). These findings have led to interesting perspectives regarding comparative pathogenicity and immunity. For N. parisii killing assays, the parasite is extracted from the infected worms by vortexing the worms in microcentrifuge tubes containing silicon carbide beads. After filtration using filter paper, the extracts are added to OP50-seeded NGM plates. Similar to other pathogen resistance assays, L4 larvae or young adults are used for the survival assays at appropriate intervals (e.g., 6 to 12 h) (Troemel et al., 2008). Upon completion of survival assays, data should be analyzed with proper statistical methods. Two widely used curves for survival analysis are simple survival curves and mortality rate curves. The most commonly used survival curves are Kaplan-Meier survival plots, which illustrate the percent of live animals against time (Kaplan and Meier, 1958). Using these plots, the effects of specific experimental treatments on survival are analyzed by obtaining mean, median, and/or maximum survival times. Several statistical methods are employed for analyzing survival curves, such as the log-rank test and Fisher’s exact test (Fisher, 1990; Mantel, 1966). The log-rank test is used for comparing the survival distributions under two conditions and yields average survival times and P-values. Fisher’s exact test is performed to obtain survival rates at specific time points. Mortality rate curves are drawn by calculating mortality rates, which are obtained by dividing changes in death incidence by time, and are used for deducing causes of deaths: accumulation of irreversible damage vs. short-term vulnerability. Several bioinformatic tools used for drawing these curves and for statistical analysis have been developed; these include open-source programs, such as online application for survival analysis (OASIS) (Yang et al., 2011), OASIS 2 (Han et al., 2016), and SurvCurv (Ziehm et al., 2015), as well as various commercially available programs. In this review, we described survival assays using populations of C. elegans and aimed to provide information regarding the basic principles and key references for specific types of survival assays. The molecular and cellular basis for the regulatory mechanisms of C. elegans physiology can be determined by performing these assays. For example, lifespan and abiotic stress resistance assays have been critical for identifying key aging- and stress-associated regulatory factors and pathways, such as DAF-16/FOXO and HSF-1 transcription factors acting in the IIS pathway (Altintas et al., 2016). Likewise, pathogen resistance assays have enabled understanding of pathogenecity and immunity through the identification of critical virulence factors and immune–regulatory factors (Ewbank and Pujol, 2016; Kim and Ewbank, 2015). In addition, studies indicate that survival assays using isogenic populations of C. elegans can yield clues regarding stochastic and epigenetic effects on specific physiological processes (Greer et al., 2011; Herndon et al., 2002; Rechavi et al., 2014; Stroustrup et al., 2016). As shown by numerous important discoveries made in the last 40 years, survival assays using C. elegans will continue leading the way to unraveling novel regulatory mechanisms crucial for animal physiology. Fig. 1. Lifespan assays are either performed with solid or liquid media. Solid culture systems using agar-based media are a major method for lifespan assays. Liquid culture systems using S-media are widely used for testing the effects of chemicals on lifespan. Synchronized worms at a specific developmental stage are transferred for manual or automatic counting, and results are then analyzed using various statistical tools. Fig. 2. C. elegans survival assays that measure resistance against various abiotic stresses, such as oxidative stress, heat, cold, osmotic stress, hypoxia, hyperoxia, ultraviolet radiation, endoplasmic reticulum stress, and heavy metal stress, contribute to the investigation of C. elegans responses to internal or external stresses. Shown are various stress-inducing agents with typical assay conditions. Fig. 3. Shown are representative pathogenic bacteria, fungi, and parasites used for C. elegans pathogen resistance assays. Specific assays using P. aeruginosa (PA14), the most popular model pathogen for C. elegans, are depicted briefly; slow-killing assays that use small-lawn or big-lawn assays and fast-killing assays are shown. Aitlhadj, L., and Stürzenbaum, S.R. (2010). The use of FUdR can cause prolonged longevity in mutant nematodes. Mech Ageing Dev. 131, 364-365. Alspaugh, J.A. (2015). Virulence mechanisms and Cryptococcus neoformans pathogenesis. Fungal Genet Biol. 78, 55-58. Altintas, O., Park, S., and Lee, S.J. (2016). The role of insulin/IGF-1 signaling in the longevity of model invertebrates, C. elegans and D. melanogaster. BMB Rep. 49, 81-92. Amrit, F.R., Ratnappan, R., Keith, S.A., and Ghazi, A. (2014). The C. elegans lifespan assay toolkit. Methods. 68, 465-475. Barsyte, D., Lovejoy, D.A., and Lithgow, G.J. (2001). Longevity and heavy metal resistance in daf-2 and age-1 long-lived mutants of Caenorhabditis elegans. FASEB J. 15, 627-634. Beanan, M.J., and Strome, S. (1992). Characterization of a germ-line proliferation mutation in C. elegans. Development. 116, 755-766. Cabreiro, F., Au, C., Leung, K.Y., Vergara-Irigaray, N., Cochemé, H.M., Noori, T., Weinkove, D., Schuster, E., Greene, N.D., and Gems, D. (2013). Metformin retards aging in C. elegans by altering microbial folate and methionine metabolism. Cell. 153, 228-239. Choe, K.P., and Strange, K. (2007). Molecular and genetic characterization of osmosensing and signal transduction in the nematode Caenorhabditis elegans. FEBS J. 274, 5782-5789. Cleland, W.W. (1964). DITHIOTHREITOL, A NEW PROTECTIVE REAGENT FOR SH GROUPS. Biochemistry. 3, 480-482. Corsi, A.K., Wightman, B., and Chalfie, M. (2015). A transparent window into biology: a primer on Caenorhabditis elegans. Worm-Book, 1-31. Darby, C. (2005). Interactions with microbial pathogens. WormBook, 1-15. Doonan, R., McElwee, J.J., Matthijssens, F., Walker, G.A., Houthoofd, K., Back, P., Matscheski, A., Vanfleteren, J.R., and Gems, D. (2008). Against the oxidative damage theory of aging: superoxide dismutases protect against oxidative stress but have little or no effect on life span in Caenorhabditis elegans. Genes Dev. 22, 3236-3241. Ewbank, J.J. (2006). Signaling in the immune response. WormBook, 1-12. Ewbank, J.J., and Pujol, N. (2016). Local and long-range activation of innate immunity by infection and damage in C. elegans. Curr Opin Immunol. 38, 1-7. Félix, M.A., Ashe, A., Piffaretti, J., Wu, G., Nuez, I., Bélicard, T., Jiang, Y., Zhao, G., Franz, C.J., and Goldstein, L.D. (2011). Natural and experimental infection of Caenorhabditis nematodes by novel viruses related to nodaviruses. PLoS Biol. 9, e1000586. Ford, S.A., Kao, D., Williams, D., and King, K.C. (2016). Microbe-mediated host defence drives the evolution of reduced pathogen virulence. Nat Commun. 7, 13430. Franz, C.J., Zhao, G., Félix, M.A., and Wang, D. (2012). Complete genome sequence of Le Blanc virus, a third Caenorhabditis nematode-infecting virus. J Virol. 86, 11940. Freedman, J.H., Slice, L.W., Dixon, D., Fire, A., and Rubin, C.S. (1993). The novel metallothionein genes of Caenorhabditis elegans. Structural organization and inducible, cell-specific expression. J Biol Chem. 268, 2554-2564. Garigan, D., Hsu, A.L., Fraser, A.G., Kamath, R.S., Ahringer, J., and Kenyon, C. (2002). Genetic analysis of tissue aging in Caenorhabditis elegans: a role for heat-shock factor and bacterial proliferation. Genetics. 161, 1101-1112. Gems, D., and Riddle, D.L. (1996). Longevity in Caenorhabditis elegans reduced by mating but not gamete production. Nature. 379, 723-725. Gill, M.S., Olsen, A., Sampayo, J.N., and Lithgow, G.J. (2003). An automated high-throughput assay for survival of the nematode Caenorhabditis elegans. Free Radic Biol Med. 35, 558-565. Greer, E.L., Maures, T.J., Ucar, D., Hauswirth, A.G., Mancini, E., Lim, J.P., Benayoun, B.A., Shi, Y., and Brunet, A. (2011). Transgenerational epigenetic inheritance of longevity in Caenorhabditis elegans. Nature. 479, 365-371. Hall, J., Haas, K.L., and Freedman, J.H. (2012). Role of MTL-1, MTL-2, and CDR-1 in mediating cadmium sensitivity in Caenorhabditis elegans. Toxicol Sci. 128, 418-426. Han, S.K., Lee, D., Lee, H., Kim, D., Son, H.G., Yang, J.S., Lee, S.V., and Kim, S. (2016). OASIS 2: online application for survival analysis 2 with features for the analysis of maximal lifespan and healthspan in aging research. Oncotarget. 7, 56147-56152. Herndon, L.A., Schmeissner, P.J., Dudaronek, J.M., Brown, P.A., Listner, K.M., Sakano, Y., Paupard, M.C., Hall, D.H., and Driscoll, M. (2002). Stochastic and genetic factors influence tissue-specific decline in ageing C. elegans. Nature. 419, 808-814. Hodgkin, J., and Partridge, F.A. (2008). Caenorhabditis elegans meets microsporidia: the nematode killers from Paris. PLoS Biol. 6, 2634-2637. Hwang, A.B., and Lee, S.J. (2011). Regulation of life span by mitochondrial respiration: the HIF-1 and ROS connection. Aging (Albany NY). 3, 304-310. Hwang, A.B., Jeong, D.E., and Lee, S.J. (2012). Mitochondria and organismal longevity. Curr Genomics. 13, 519-532. Hwang, A.B., Ryu, E.A., Artan, M., Chang, H.W., Kabir, M.H., Nam, H.J., Lee, D., Yang, J.S., Kim, S., and Mair, W.B. (2014). Feedback regulation via AMPK and HIF-1 mediates ROS-dependent longevity in Caenorhabditis elegans. Proc Natl Acad Sci USA. 111, E4458-4467. Jaishankar, M., Tseten, T., Anbalagan, N., Mathew, B.B., and Beeregowda, K.N. (2014). Toxicity, mechanism and health effects of some heavy metals. Interdiscip Toxicol. 7, 60-72. Jiang, B., Ren, C., Li, Y., Lu, Y., Li, W., Wu, Y., Gao, Y., Ratcliffe, P.J., Liu, H., and Zhang, C. (2011). Sodium sulfite is a potential hypoxia inducer that mimics hypoxic stress in Caenorhabditis elegans. J Biol Inorg Chem. 16, 267-274. Kaplan, E.L., and Meier, P. (1958). Nonparametric estimation from incomplete observations. J Am Statistical Association. 53, 457-481. Keith, S.A., Amrit, F.R., Ratnappan, R., and Ghazi, A. (2014). The C. elegans healthspan and stress-resistance assay toolkit. Methods. 68, 476-486. Kenyon, C.J. (2010). The genetics of ageing. Nature. 464, 504-512. Kim, D.H., and Ausubel, F.M. (2005). Evolutionary perspectives on innate immunity from the study of Caenorhabditis elegans. Curr Opin Immunol. 17, 4-10. Kim, D.H., and Ewbank, J.J. (2015). Signaling in the innate immune response. WormBook, 1-51. Kirienko, N.V., Kirienko, D.R., Larkins-Ford, J., Wählby, C., Ruvkun, G., and Ausubel, F.M. (2013). Pseudomonas aeruginosa disrupts Caenorhabditis elegans iron homeostasis, causing a hypoxic response and death. Cell Host Microbe. 13, 406-416. Kirienko, N.V., Cezairliyan, B.O., Ausubel, F.M., and Powell, J.R. (2014). Pseudomonas aeruginosa PA14 pathogenesis in Caenorhabditis elegans. Methods Mol Biol. 1149, 653-669. Kourtis, N., Nikoletopoulou, V., and Tavernarakis, N. (2012). Small heat-shock proteins protect from heat-stroke-associated neurodegeneration. Nature. 490, 213-218. Kuo, S.C., and Lampen, J.O. (1974). Tunicamycin--an inhibitor of yeast glycoprotein synthesis. Biochem Biophys Res Commun. 58, 287-295. Labbadia, J., and Morimoto, R.I. (2015). The biology of proteostasis in aging and disease. Annu Rev Biochem. 84, 435-464. Lamitina, T., Huang, C.G., and Strange, K. (2006). Genome-wide RNAi screening identifies protein damage as a regulator of osmoprotective gene expression. Proc Natl Acad Sci USA. 103, 12173-12178. Lee, S.J., Murphy, C.T., and Kenyon, C. (2009). Glucose shortens the life span of C. elegans by downregulating DAF-16/FOXO activity and aquaporin gene expression. Cell Metab. 10, 379-391. Lee, S.J., Hwang, A.B., and Kenyon, C. (2010). Inhibition of respiration extends C. elegans life span via reactive oxygen species that increase HIF-1 activity. Curr Biol. 20, 2131-2136. Lee, Y., An, S.W.A., Artan, M., Seo, M., Hwang, A.B., Jeong, D.-E., Son, H.G., Hwang, W., Lee, D., and Seo, K. (2015). Genes and Pathways That Influence Longevity in Caenorhabditis elegans. In Aging Mechanisms (Springer), 123-169. Lithgow, G.J., White, T.M., Hinerfeld, D.A., and Johnson, T.E. (1994). Thermotolerance of a long-lived mutant of Caenorhabditis elegans. J Gerontol. 49, B270-276. Lu, N., and Goetsch, K. (1993). Carbohydrate requirement of Caenorhabditis elegans and the final development of a chemically defined medium. Nematologica. 39, 303-311. Mantel, N. (1966). Evaluation of survival data and two new rank order statistics arising in its consideration. Cancer Chemother Rep. 50, 163-170. Mathew, M.D., Mathew, N.D., and Ebert, P.R. (2012). WormScan: a technique for high-throughput phenotypic analysis of Caenorhabditis elegans. PLoS One. 7, e33483. Murakami, S., and Johnson, T.E. (1996). A genetic pathway conferring life extension and resistance to UV stress in Caenorhabditis elegans. Genetics. 143, 1207-1218. Murray, P., Hayward, S.A., Govan, G.G., Gracey, A.Y., and Cossins, A.R. (2007). An explicit test of the phospholipid saturation hypothesis of acquired cold tolerance in Caenorhabditis elegans. Proc Natl Acad Sci USA. 104, 5489-5494. Mylonakis, E., Ausubel, F.M., Perfect, J.R., Heitman, J., and Calderwood, S.B. (2002). Killing of Caenorhabditis elegans by Cryptococcus neoformans as a model of yeast pathogenesis. Proc Natl Acad Sci USA. 99, 15675-15680. Mylonakis, E., Casadevall, A., and Ausubel, F.M. (2007). Exploiting amoeboid and non-vertebrate animal model systems to study the virulence of human pathogenic fungi. PLoS Pathog. 3, e101. O’Neil, N., and Rose, A. (2006). DNA repair. WormBook, 1-12. Oliveira, R.P., Porter Abate, J., Dilks, K., Landis, J., Ashraf, J., Murphy, C.T., and Blackwell, T.K. (2009). Condition-adapted stress and longevity gene regulation by Caenorhabditis elegans SKN-1/Nrf. Aging Cell. 8, 524-541. Papenfort, K., and Bassler, B.L. (2016). Quorum sensing signal-response systems in Gram-negative bacteria. Nat Rev Microbiol. 14, 576-588. Powell-Coffman, J.A. (2010). Hypoxia signaling and resistance in C. elegans. Trends Endocrinol Metab. 21, 435-440. Pulak, R. (2006). Techniques for analysis, sorting, and dispensing of C. elegans on the COPAS flow-sorting system. Methods Mol Biol. 351, 275-286. Rechavi, O., Houri-Ze’evi, L., Anava, S., Goh, W.S., Kerk, S.Y., Hannon, G.J., and Hobert, O. (2014). Starvation-induced transgenerational inheritance of small RNAs in C. elegans. Cell. 158, 277-287. Reddy, K.C., Andersen, E.C., Kruglyak, L., and Kim, D.H. (2009). A polymorphism in npr-1 is a behavioral determinant of pathogen susceptibility in C. elegans. Science. 323, 382-384. Rodriguez, M., Snoek, L.B., De Bono, M., and Kammenga, J.E. (2013). Worms under stress: C. elegans stress response and its relevance to complex human disease and aging. Trends Genet. 29, 367-374. Rohlfing, A.K., Miteva, Y., Hannenhalli, S., and Lamitina, T. (2010). Genetic and physiological activation of osmosensitive gene expression mimics transcriptional signatures of pathogen infection in C. elegans. PloS one. 5, e9010. Rooney, J.P., Luz, A.L., González-Hunt, C.P., Bodhicharla, R., Ryde, I.T., Anbalagan, C., and Meyer, J.N. (2014). Effects of 5′-fluoro-2-deoxyuridine on mitochondrial biology in Caenorhabditis elegans. Exp Gerontol. 56, 69-76. Samuelson, A.V., Carr, C.E., and Ruvkun, G. (2007). Gene activities that mediate increased life span of C. elegans insulin-like signaling mutants. Genes Dev. 21, 2976-2994. Savory, F.R., Sait, S.M., and Hope, I.A. (2011). DAF-16 and Δ9 desaturase genes promote cold tolerance in long-lived Caenorhabditis elegans age-1 mutants. PLoS One. 6, e24550. Scott, B.A., Avidan, M.S., and Crowder, C.M. (2002). Regulation of hypoxic death in C. elegans by the insulin/IGF receptor homolog DAF-2. Science. 296, 2388-2391. Shen, X., Ellis, R.E., Lee, K., Liu, C.Y., Yang, K., Solomon, A., Yoshida, H., Morimoto, R., Kurnit, D.M., and Mori, K. (2001). Complementary signaling pathways regulate the unfolded protein response and are required for C. elegans development. Cell. 107, 893-903. Sies, H. (1985). Oxidative stress: introductory remarks. Oxidative Stress, 1-8. Sonoda, S., Ohta, A., Maruo, A., Ujisawa, T., and Kuhara, A. (2016). Sperm affects head sensory neuron in temperature tolerance of Caenorhabditis elegans. Cell Rep. 16, 56-65. Stiernagle, T. (2006). Maintenance of C. elegans. WormBook, 1-11. Stroustrup, N., Ulmschneider, B.E., Nash, Z.M., López-Moyado, I.F., Apfeld, J., and Fontana, W. (2013). The Caenorhabditis elegans lifespan machine. Nat Methods. 10, 665-670. Stroustrup, N., Anthony, W.E., Nash, Z.M., Gowda, V., Gomez, A., López-Moyado, I.F., Apfeld, J., and Fontana, W. (2016). The temporal scaling of Caenorhabditis elegans ageing. Nature. 530, 103-107. Sun, A.Y., and Lambie, E.J. (1997). gon-2, a gene required for gonadogenesis in Caenorhabditis elegans. Genetics. 147, 1077-1089. Szewczyk, N.J., Udranszky, I.A., Kozak, E., Sunga, J., Kim, S.K., Jacobson, L.A., and Conley, C.A. (2006). Delayed development and lifespan extension as features of metabolic lifestyle alteration in C. elegans under dietary restriction. J Exp Biol. 209, 4129-4139. Troemel, E.R. (2016). Host-microsporidia interactions in Caenorhabditis elegans, a model nematode host. Microbiol Spectr. 4. Troemel, E.R., Félix, M.A., Whiteman, N.K., Barriére, A., and Ausubel, F.M. (2008). Microsporidia are natural intracellular parasites of the nematode Caenorhabditis elegans. PLoS Biol. 6, 2736-2752. Van Raamsdonk, J.M., and Hekimi, S. (2011). FUdR causes a twofold increase in the lifespan of the mitochondrial mutant gas-1. Mech Ageing Dev. 132, 519-521. Van Raamsdonk, J.M., and Hekimi, S. (2012). Superoxide dismutase is dispensable for normal animal lifespan. Proc Natl Acad Sci USA. 109, 5785-5790. Vilchez, D., Saez, I., and Dillin, A. (2014). The role of protein clearance mechanisms in organismal ageing and age-related diseases. Nat Commun. 5, 5659. Walter, P., and Ron, D. (2011). The unfolded protein response: from stress pathway to homeostatic regulation. Science. 334, 1081-1086. Wang, Y., and Hekimi, S. (2015). Mitochondrial dysfunction and longevity in animals: Untangling the knot. Science. 350, 1204-1207. Wang, D., Liu, P., and Xing, X. (2010). Pre-treatment with mild UV irradiation increases the resistance of nematode Caenorhabditis elegans to toxicity on locomotion behaviors from metal exposure. Environ Toxicol Pharmacol. 29, 213-222. Xian, B., Shen, J., Chen, W., Sun, N., Qiao, N., Jiang, D., Yu, T., Men, Y., Han, Z., and Pang, Y. (2013). WormFarm: a quantitative control and measurement device toward automated Caenorhabditis elegans aging analysis. Aging Cell. 12, 398-409. Yang, W., and Hekimi, S. (2010). A mitochondrial superoxide signal triggers increased longevity in Caenorhabditis elegans. PLoS Biol. 8, e1000556. Yang, J.S., Nam, H.J., Seo, M., Han, S.K., Choi, Y., Nam, H.G., Lee, S.J., and Kim, S. (2011). OASIS: online application for the survival analysis of lifespan assays performed in aging research. PLoS One. 6, e23525. Ziehm, M., Ivanov, D.K., Bhat, A., Partridge, L., and Thornton, J.M. (2015). SurvCurv database and online survival analysis platform update. Bioinformatics. 31, 3878-3880.